Liberalisation in the power sector is high on the agenda of policy makers, regulators and the industry around the world. There is growing recognition of the benefits of power marker liberalisation and the need to further integrate regional markets in a liberal trade and investment environment. 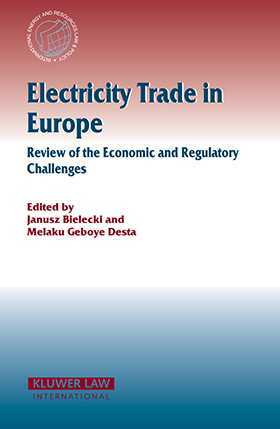 This volume brings together articles written by leading experts in the field of electricity trade and regulation in Europe. Organised in two parts, the contributions cover a range of issues from market structure, trade flows, infrastructure and investment to the regulatory framework within which the industry operates, including international trade rules and national technical, environmental and regulatory regimes. These are complex and sensitive issues requiring an in-depth understanding of the economics and regulation of the electricity trade and the primary object of this volume is to contribute to an informed debate on the subject. To this end, the contributors demonstrate how a competition ¿friendly and liberal environment for electricity trade, including a system of non-discriminatory and transparent access to transmission and distribution networks, could contribute to improving market integration, economic efficiency , supply security and environmental health. Foreword. List of Acronyms. Part I. Operational and Economic Aspects. 1. Electricity Trade: Overview of Current Flows and Infrastructure. Janusz Bielecki. 2. European Interconnection: State of the Art 2003. Georges de Montravel. 3. Regional Electricity Cooperation and Integration. Francois Verneyre. 4. Impact of Liberalisation and Investment Performance in the Power Sector. Ralf Dickel. 5. Development of Interconnections and Reliability Standards. Frank Vandenberghe. Part II. Regulatory Aspects. 6. Overview of the Regulatory Environment for Trade in Electricity. Andras Lakatos. 7. Role of Regulatory Arrangements in Developing the Power Markets. David Kennedy. 8. International Energy Trade and Access to Network: the case of Electricity. Thomas Wälde and Andreas Gunst. 9. Cross Border Capacity Allocation Methods. Charles Zimmerman. 10. Multilateral Rules and Trade in Energy Goods and Services: the case of Electricity. Simonetta Zarrilli. 11. Electricity Trade and Trade-Related Environmental Measures. Janusz Bielecki and Leif K. Ervik. 12. Trade-Neutral Policies for the Promotion of Electricity from Renewables. Leigh Hancher. List of Figures. List of Tables. List of Boxes.